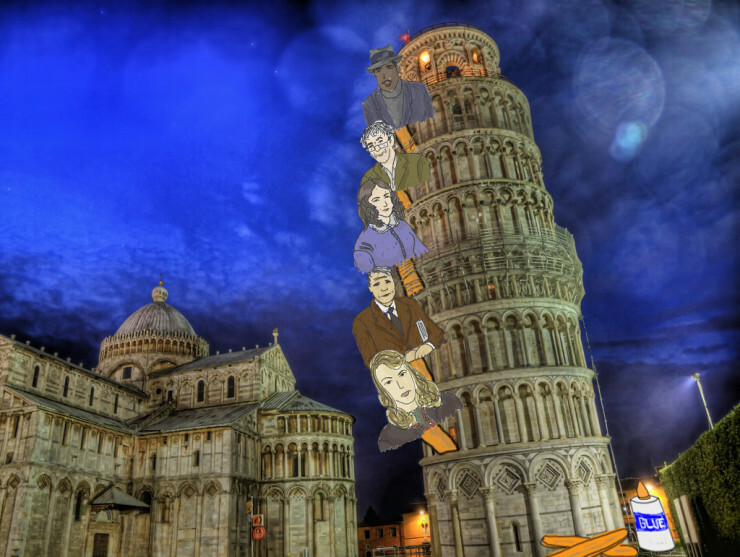 Form It is a prompt that focuses on exploring our topic through form poetry. This time, we’re going to “form” horizons. Be specific. Think nouns instead of adjectives. Consider doing a little research about the topic you are covering: its history, associated words, music, art, sculpture, architecture, fashion, science, and so on. Look for unusual details, so you can speak convincingly and intriguingly. I had my students make a “Poet on to Go”(BTW: the larger craft sticks work better than the smaller ones) last year–they loved the activity. I think this year I will have them recite a poem of their choosing from the poet of their choice and/or have them create a play with the poets…still ruminating about the lesson plan…anyway…enjoy the photos! It’s a great day to let Adrienne Rich take a few calls. Bring Rumi with you for some banter at the water cooler. Robert Frost would enjoy leading your staff meeting. And Emily Dickinson would be great at filing. We believe there is poetry in the workplace, and there’s definitely a place for poets at work. 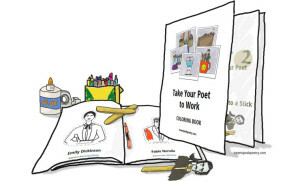 We have a great collection of poets for you to color, cut out and glue to a popsicle stick to join you on the job. But over the past few years as we’ve celebrated Take Your Poet to Work Day, we’ve noticed a trend: many of our favorite poets just don’t want to go to work. Instead, like many of us often dream to do, they find their way to the beach, or to the coffee shop, or to the county fair instead. So this year, we thought we’d get ahead of our poets and take them to some great destinations from around the world. 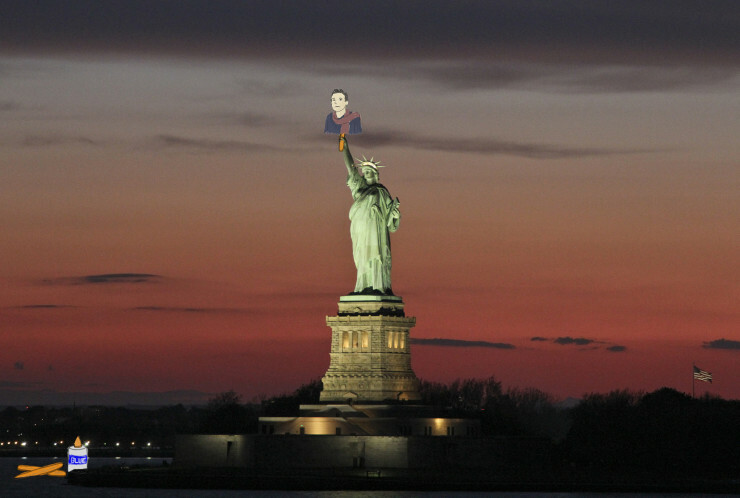 Adrienne Rich met Lady Liberty in New York City. I’d have never guessed that Emily Dickinson would ever say she was ready for her close-up, butPablo Neruda and Sara Teasdale talked her into a trip to Hollywood. 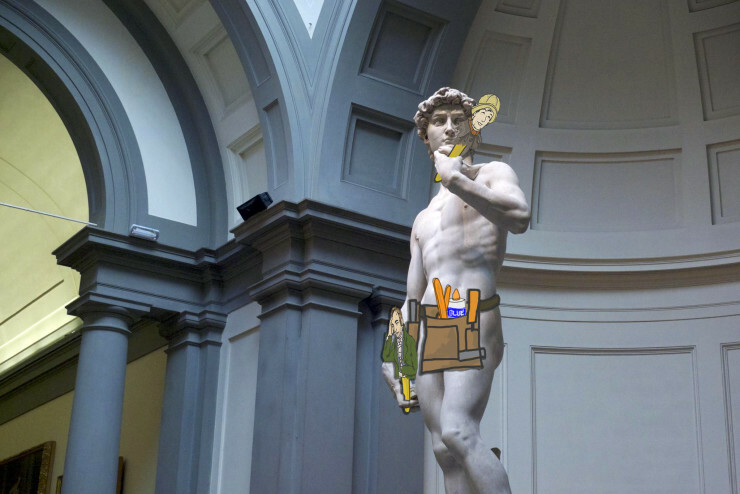 Wisława Szymborska and William Wordsworth came up with a plan to make Michelangelo’s Statue of David safe for work. 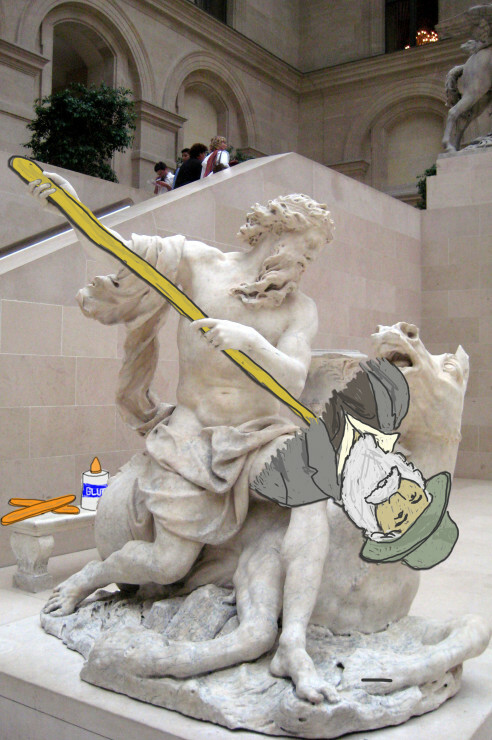 Walt Whitman might not be the best tool for fighting sea serpents, but if you’re Neptune, I guess you can make do. 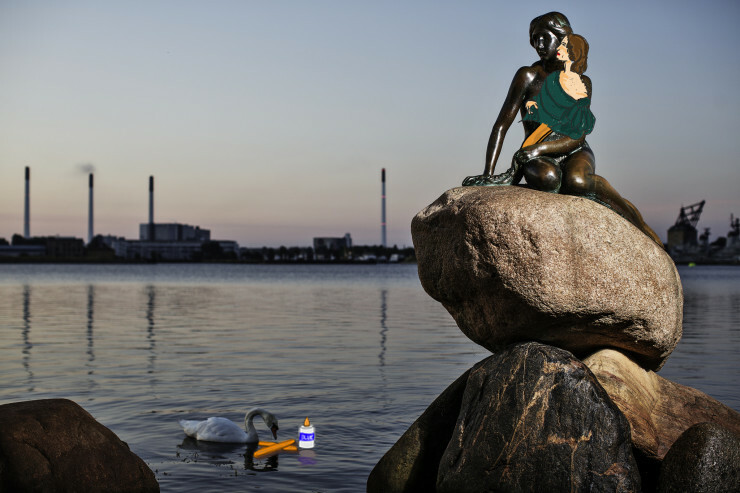 Emily Brontë and a mermaid shared a quiet moment in Copenhagen. 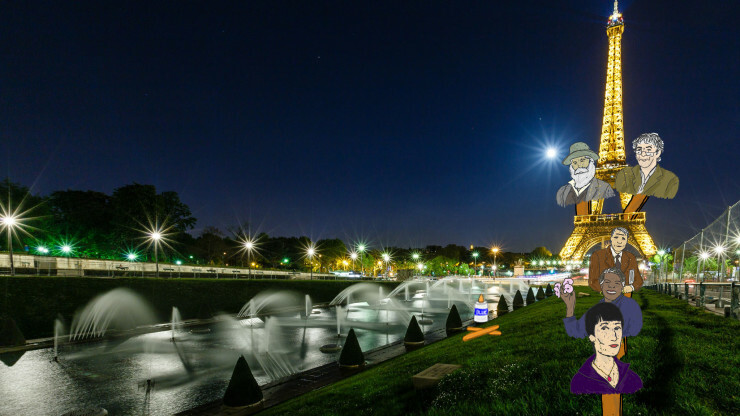 Anna Akhmatova,Maya Angelou, and Robert Frost waited in line for Seamus Heaney and Walt Whitman to come down so they could have their turn on the Eiffel Tower. 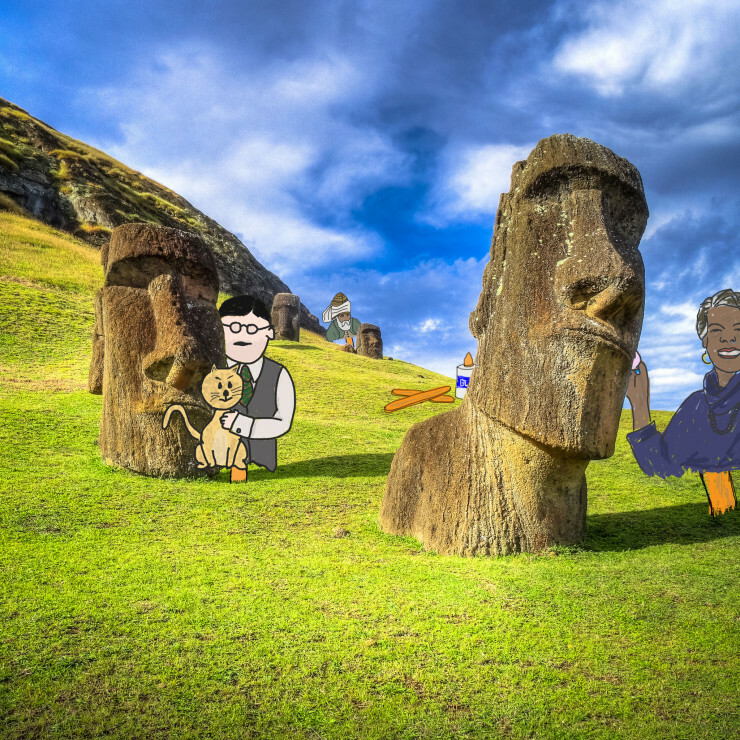 Maya Angelou, T. S. Eliot, and Rumi enjoyed an afternoon of hide-n-seek at Easter Island. 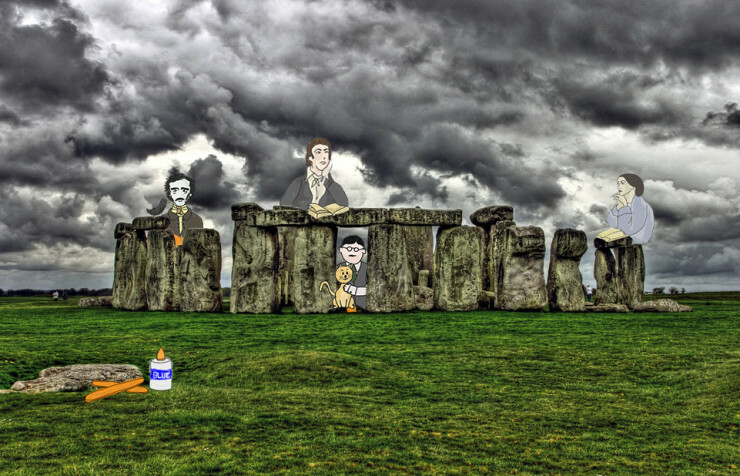 Eliot had so much fun at Easter Island he invited Edgar Allan Poe to Stonehenge. Poe brought along John Keats and Christina Rossetti, who just wanted to read books all day. 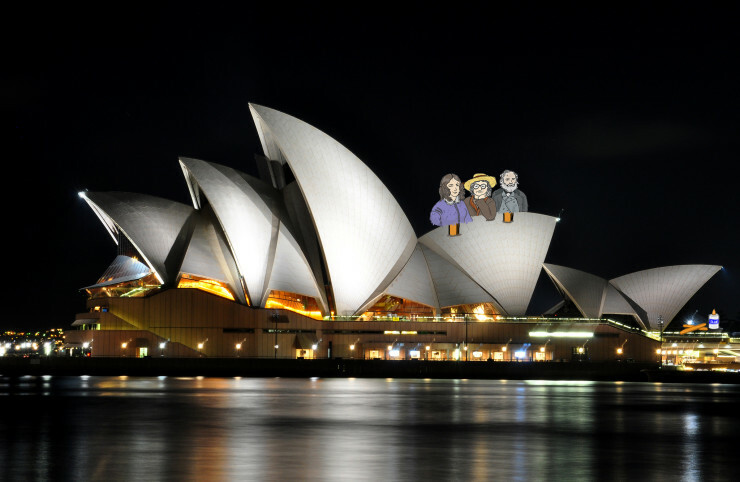 Judith Wright invited friends Henry Wadsworth Longfellow and Elizabeth Barrett Browning over for an evening at the Sydney Opera House. 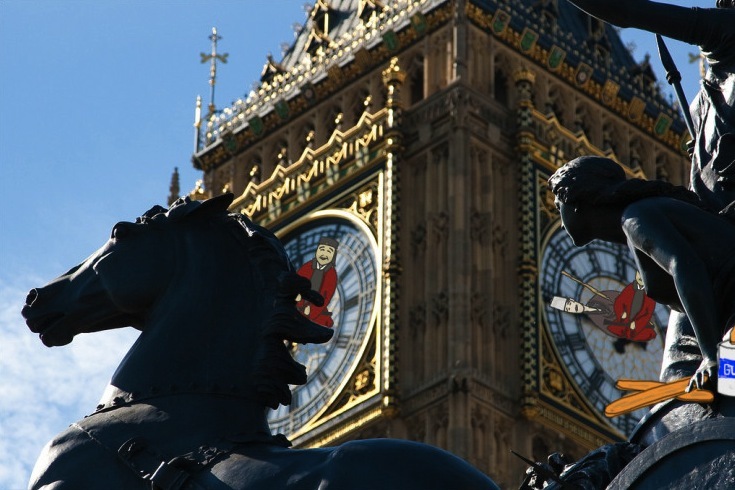 Matsuo Basho and Kobayashi Issa went to London to give Big Ben a hand. 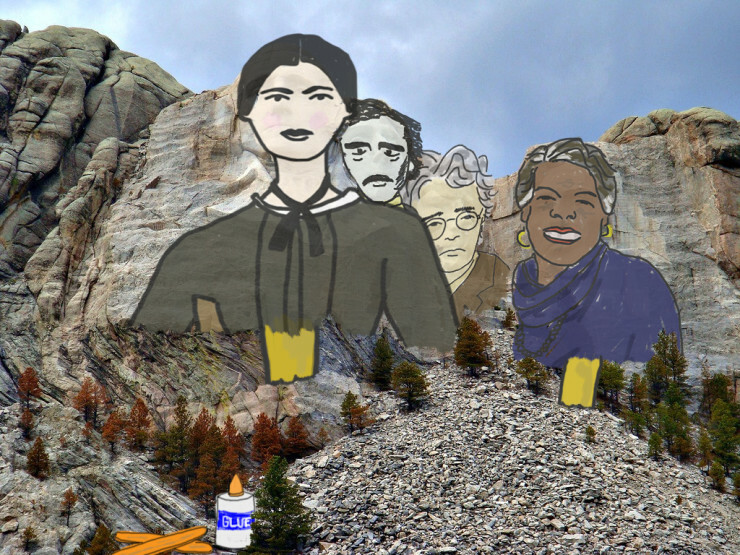 And wouldn’t you know it, Emily Dickinson, Maya Angelou, Edgar Allan Poe and William Butler Yeats came over to my home state and made an appearance at Mount Rushmore. So where are you and your poet going today? Whether you’re going to work, to the beach, or on vacation, take along your favorite poet. Tweet a photo to us at @tspoetry with the hashtag#poettowork, and we might feature you. We can’t wait to see where you go! Photos used under a Creative Commons license and sourced via Flickr; modified to include embedded poets. 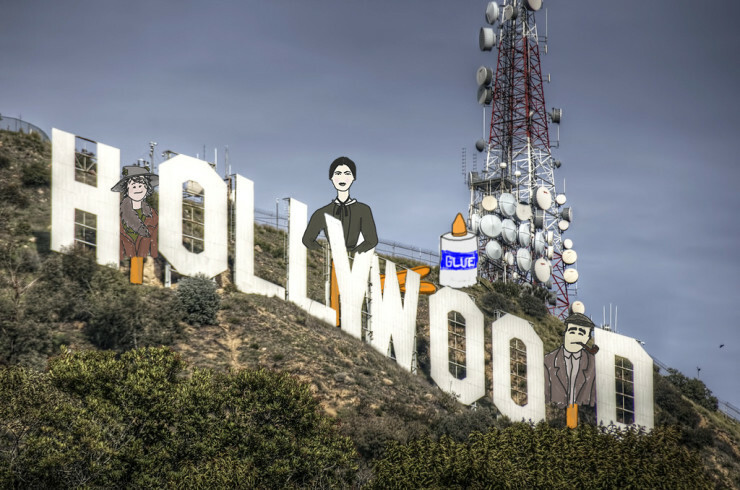 Mount Rushmore by CamellaTWU, Statue of Liberty by Fr Lawrence Lew, O.P., Neptune by Wally Gobetz, Statue of David by Darren & Brad, Leaning Tower of Pisa by Neil Howard, Easter Island by Babak Fakhamsadeh, Stonehenge by vgm8383, Big Ben by André Zehetbauer, Hollywood by Neil Kremer, Eiffel Tower by Gilad Rom, Sydney Opera House byMotiqua, Copenhagen by Greenland Travel. 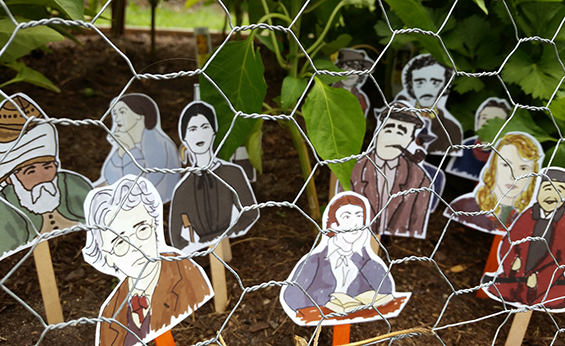 I had my students make a “Poet on a Stick” last year–they loved the activity. I think this year I will have them recite a poem of their choosing from the poet of their choice and/or have them create a play with the poets…still ruminating about the lesson plan…anyway…Enjoy the photos! In just a few short days, crayons, popsicle sticks and poets will come together to celebrate the best day of the year in workplaces around the world. The re-title classics are fantastic! –but may not be suitable for middle school. Read the following poems (also posted to your instagram, twitter, tumblr, snapchat, tinder, apple watch, hoverboard, wifi hotspot, $300 headphones, etc.). Tweet, snap, gram, or mind-beam your thoughtful, text-based responses to each piece. Every day, we track down a fleeting wonder—something amazing that’s only happening right now. Have a tip for us? Tell us about it! Send your temporary miracles tocara@atlasobscura.com. Today is Take Your Poet to Work Day! 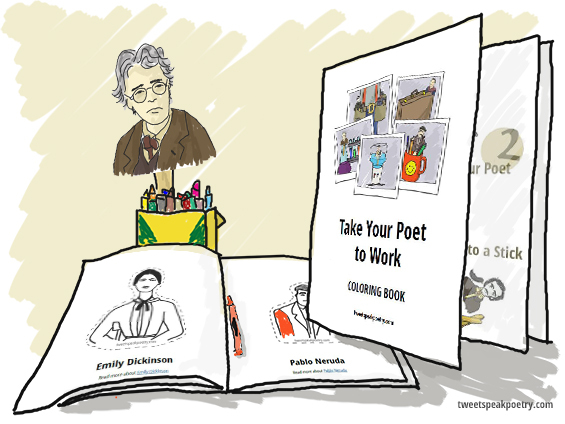 Join us and your favorite poets for all the smart fun in workplaces around the world. 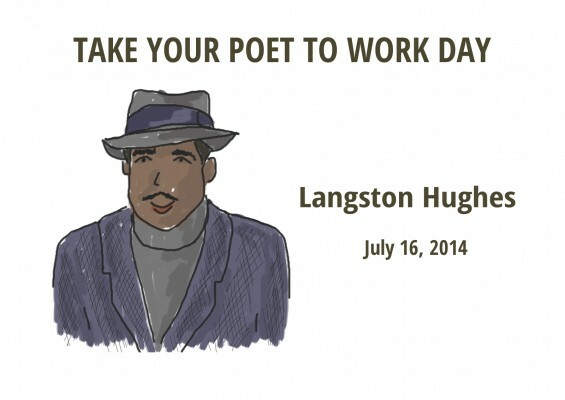 One of my favorite poets: Langston Hughes!